You wouldn’t mind sharing one of those demi john’s would you? You have plenty, you know! Ha! Looking good, sister! Wow! I haven’t seen this new tool, on your blog before. “Barbara’s recent post…” That is cool! I’m going to check this out! Your foyer is gorgeous! It does reflect you keen sense of style! I love the way you explained how each piece relates to you too. What a lovely entrance to your home! Shirley, I just read an article about entries and had me thinking too. I think the way we decorate probably does reflect the woman most of the time. That’s ok, right? Your entry is one of the prettiest I’ve seen. 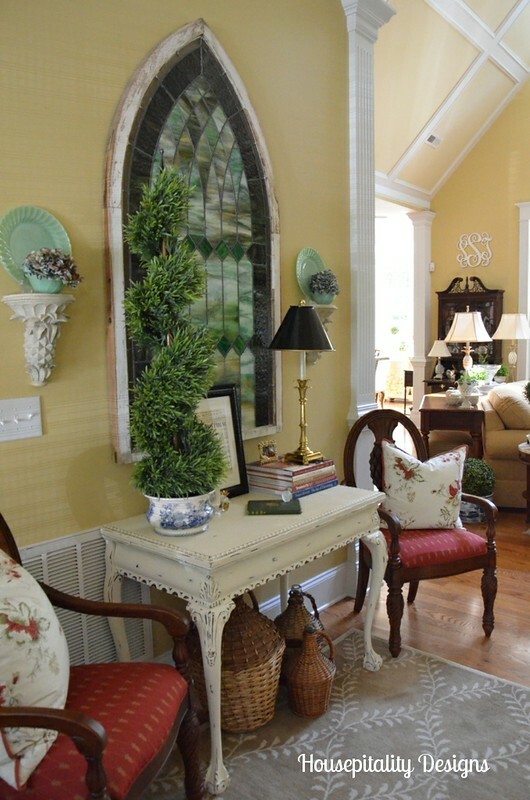 That stained glass window is stunning and I love the sheet must framed. I’m going to pin some of these. Your foyer always looks so welcoming. 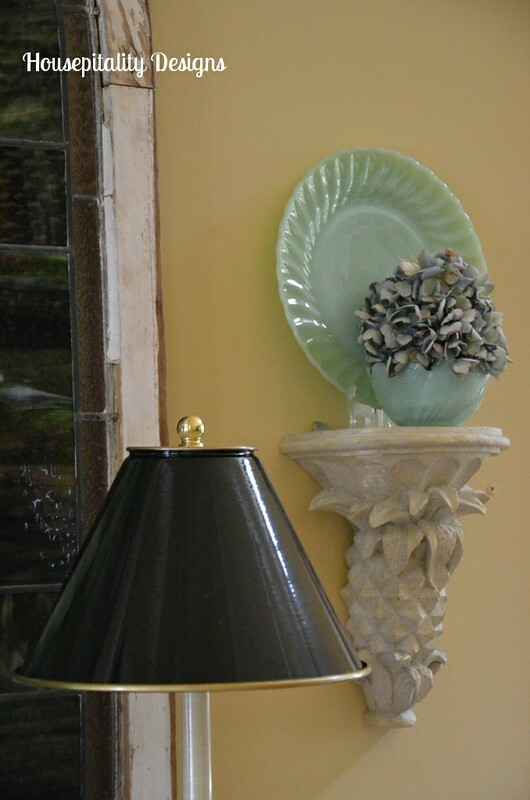 Love the jadite dishes so pretty with the stained glass. I love hydrangeas and topiaries too. 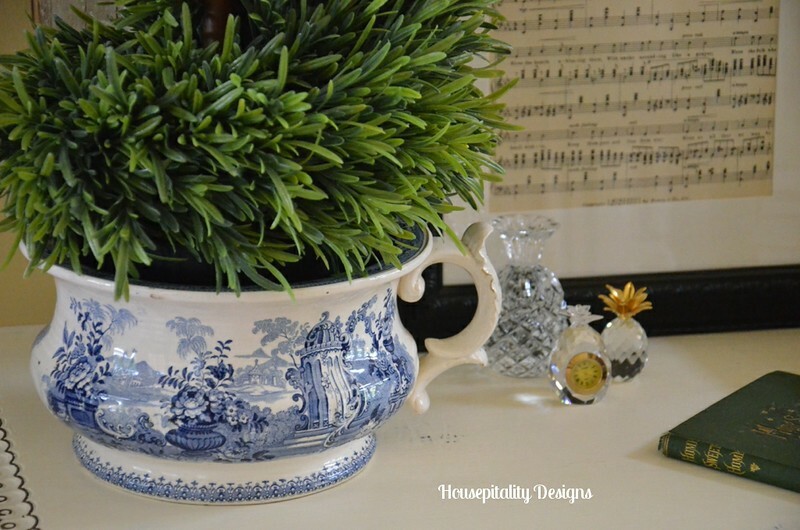 In the new house I have plans to make two topiaries with moss and put them in transferware I purchased from Nancy’s Daily Dish. I adore your topiary, what a great gift. Have a great day! I love the beautiful story of Tommy surprising you! He is so romantic, what a wonderful husband. 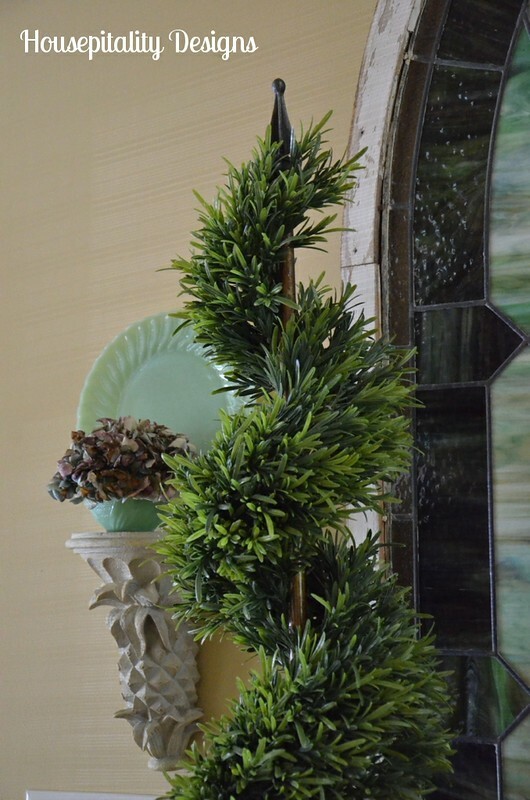 Your foyer epitomizes exactly who you are, it is absolutely gorgeous. It also shows how incredibly talented you are in the art of design. Yes, it is so you and I love the demijohns underneath. 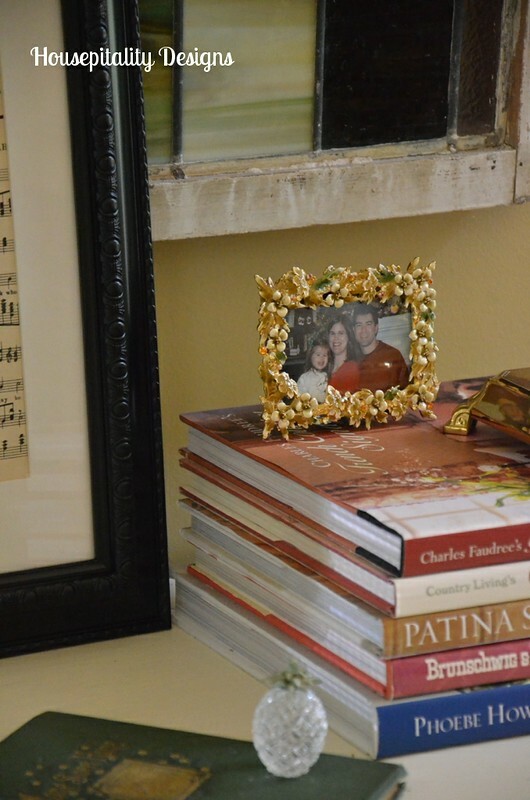 Your home(s) has always been warm and inviting to friends and family. I think your foyer reflects the person you are to a tea. Beautiful and interesting vignette as always. 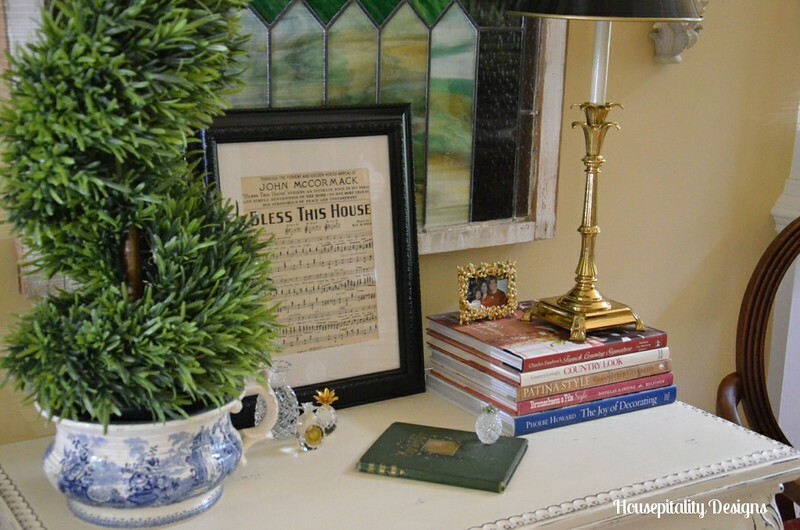 What a beautiful vignette in your entry, Shirley! It is very welcoming. I love that stained glass piece there and your table is so pretty. 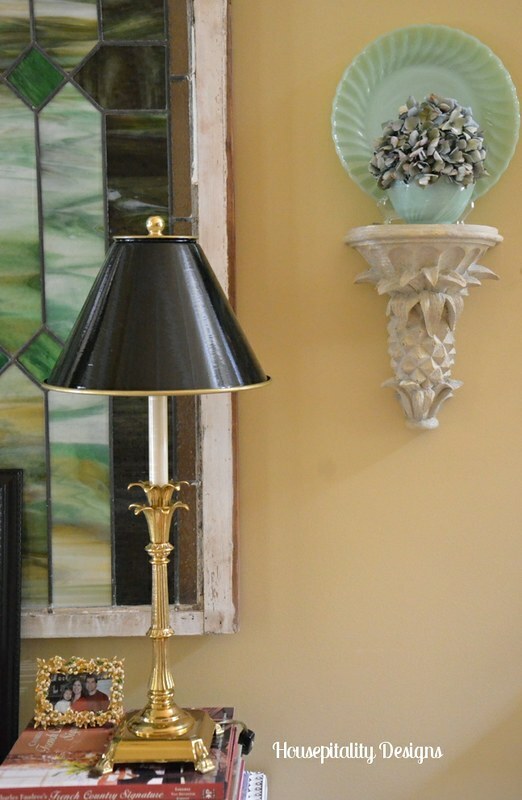 Shirley, I Loooooove you new foyer vignette. It does reflect you so well. 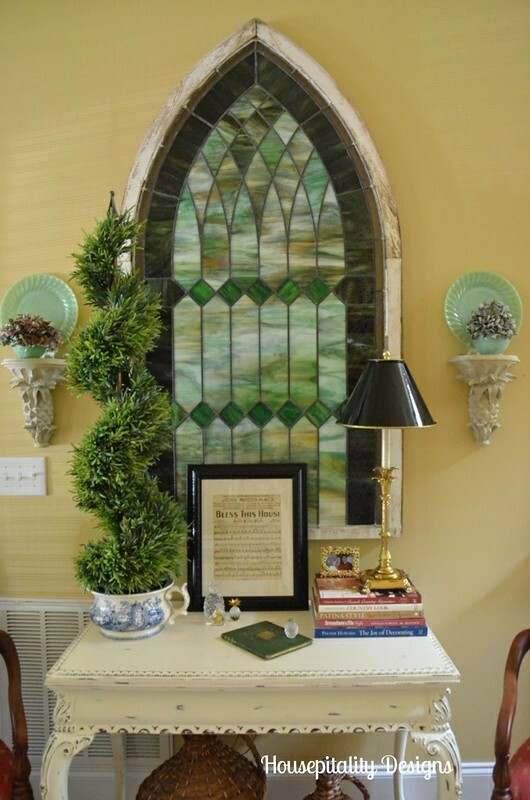 I was struck at once by the beauty of the green in the stained glass and the jadeite. The entire are is just stunning. Then so is your home. I so agree about a foyer being a reflection of who we are, in fact I think the entire house is a reflection of who we are and how we live. Your foyer is lovely, I love the combination of all the things you have gathered to display and been seen by all your guest. Very nice! So very beautiful Shirley! 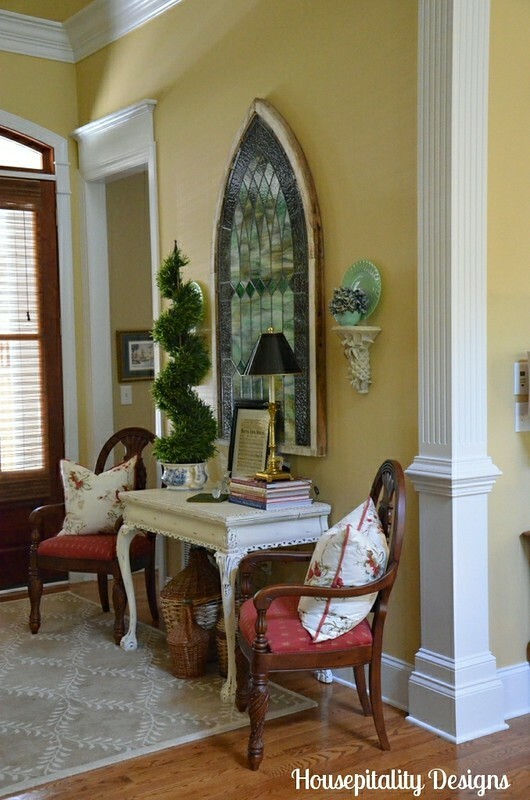 Yes, I concur, the entry way speaks volumes…it pretty much sets the tone for the rest of the home. Yours is just gorgeous and would tell me, OK< I have to get past this entry way LOL! Your entry really does say so much about who we are and what we love. that stained glass Gothic window is just priceless. love the wonderful colors! Your foyer is lovely and so welcoming! So lovely Shirley! And a little glimpse of your soul as well. 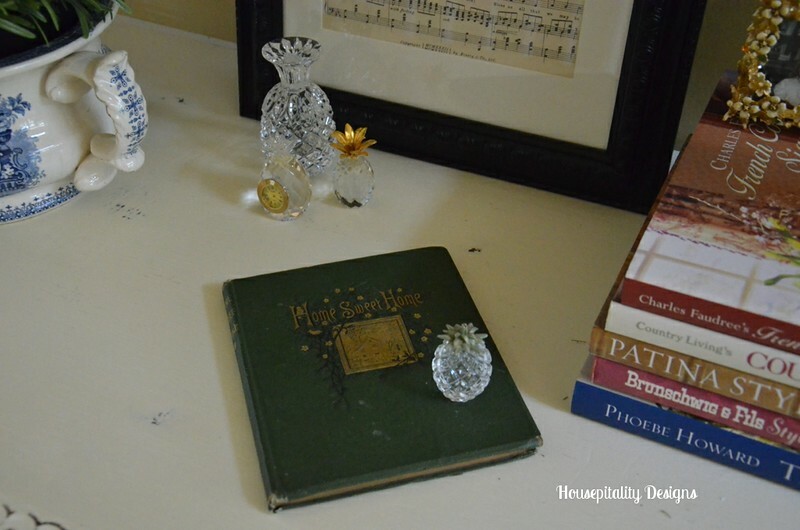 Beautiful Shirley~ I love your vintage book, window and demijohns underneath the table! Mary’s recent post…Anyone Can Be A Gardener & Winners! So pretty. Your green plates pick up the color in the stained glass. I couldn’t walk past this foyer without stopping to admire. Lovely! 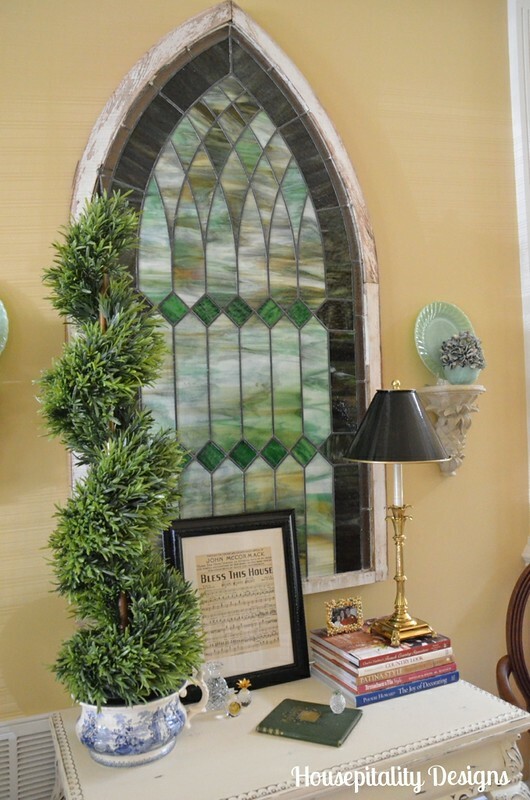 I love the stained glass, it makes a big statement…..
Nancy’s recent post…Reinforcing our Pottery Barn chairs…..
Shirley, I love the lamp on your foyer table and the lamps in your great room. Where can I find those? The foyer is beautiful! Most purdy, Shirley! You just know how to put together the perfect setting. Your foyer is so gorgeous. Oh my Shirley your entry is just stunning! I love ever detail you picked. 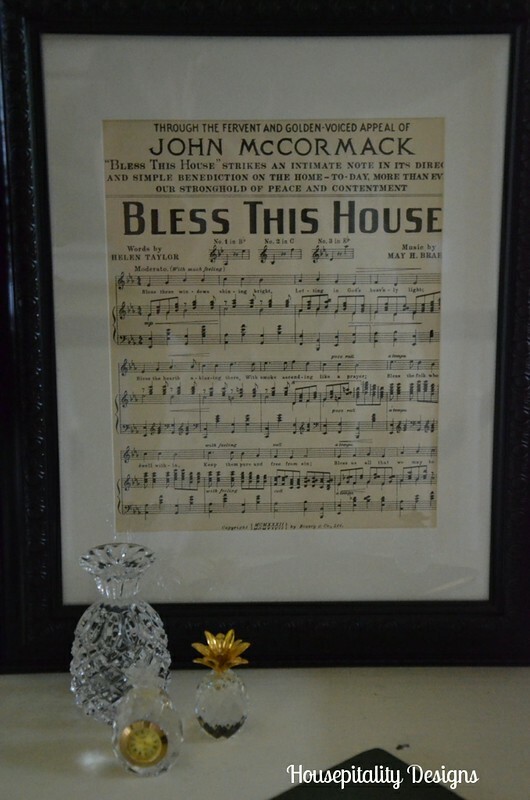 We have put our old house on the Christmas tour and I really needed this inspirations. First impressions are everything and you nailed it perfectly! BECKY’s recent post…Honey, will you make me….. I love your foyer. The green plates are so pretty with green in the window. I have a similar topiary in my kitchen. Thanks for sharing at BNOTP. Very very nice! I like that you chose special items that reflect something important to you. The stained glass piece looks just like some from my old church when I was a child. 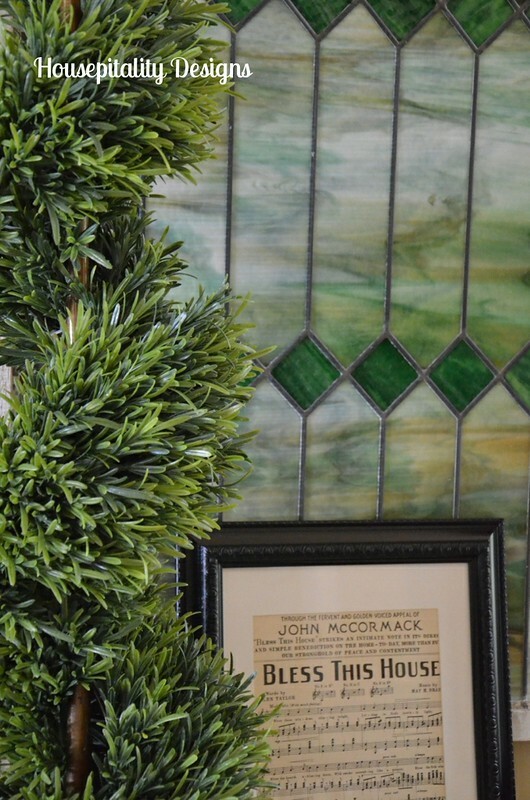 I love how the jadite color pulls on the stained glass piece. Your whole design is very thoughtful and offers a wonderful greeting! Shirley, I just love this! Everything you touch just has your unique style and I love that. I’m still discovering mine, but I’m learning! Thanks for linking up every week to our party! It all looks so stunning Shirley! 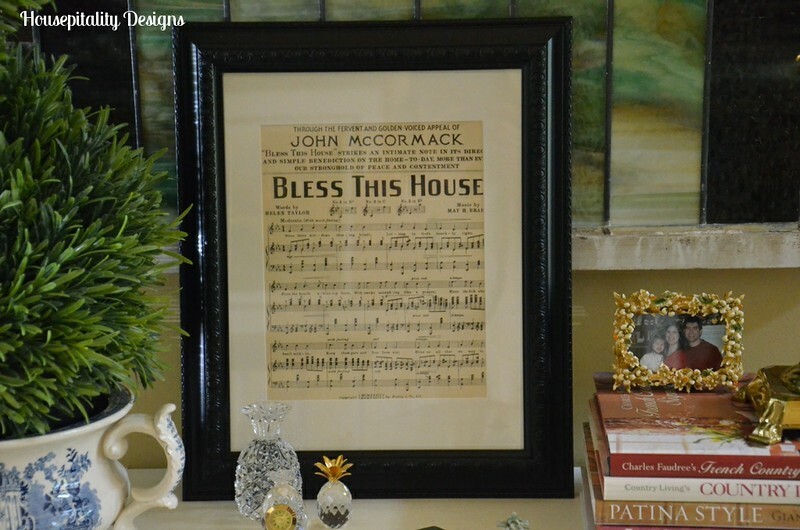 Your stained glass window is a true treasure. Such a beautiful entry Shirley! 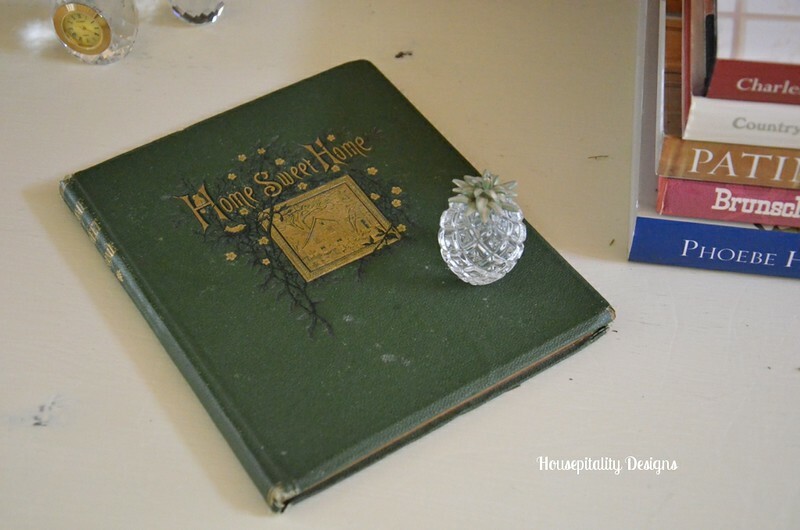 Your stained glass window is soooo beautiful, love everything, even your pineapples! Would love for you to share at Amaze Me Monday.